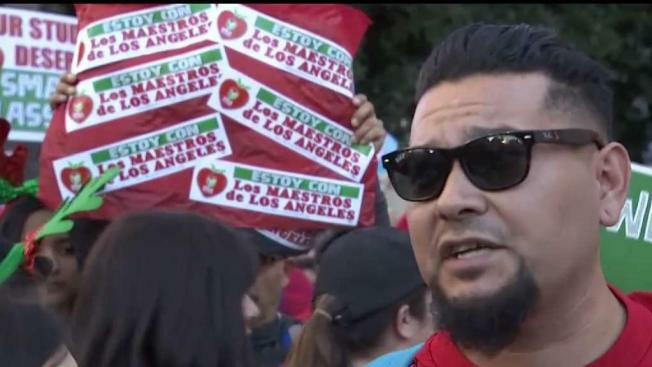 A sea of people wearing red and chanting "UTLA" swarmed City Hall as thousands of educators and their supporters marched in Downtown Los Angeles on Saturday. The teacher's union is threatening to go on strike in January if the city doesn't meet its demands for better teacher pay and more resources for schools. English teacher Laura Bernard says her school, like many others, doesn't have enough resources to care for the children, especially those in high-risk situations. "I'm not a nurse. I'm not a psychiatrist, I'm a public educator, but I'm doing the job of a social worker, a therapist, a mother because our schools are underfunded and that's what the real issue is," she said. The union is also calling for smaller class sizes, reduced testing, more librarians, and for teachers to have a spot on local school leadership councils. "Our students have needs that we are not addressing and it's been on the teachers and educators of LAUSD for all of these years and we are saying enough is enough," said Arlene Inouye, secretary for the United Teachers Los Angeles. The school district says it is negotiating in good faith but claims that the union's demands - which the district estimates would cost $800 million - are too expensive.